Hello Blog….may I present my PREZI…. Hello again blog. Time for an update. Since my last post, I have taken a few more online graduate level courses. 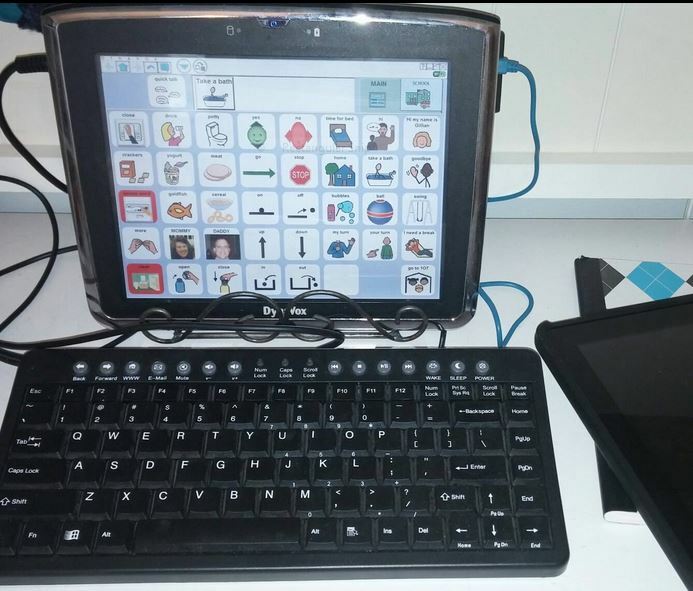 In summer 2015, I took AAC for Individuals with Autism Spectrum Disorders and Using Mobile Technology for Augmentative Communication both as electives from the University of Illinios Chicago Assistive Technology Certificate Program. In summer 2016, I am taking another course online from Bowling Green State University in preparation for either obtaining the Graduate Certificate in Assistive Technology or maybe a full masters degree. Hello blog. How I have missed you. Seeing all the Facebook and tweets about ATIA2015 has made me open the wordpress! It’s a great time to write again. I am in my 4th semester of graduate school at BGSU. I am doing an online masters program in Assistive Technology. I love it so far. On the AAC front, its once again time to re-evaluate and fine tune the current AT and AAC needs of my Gilly Bean. When Gilly first began her AAC journey, we utilized the pediatric speech and language pathology department of C.S. Mott Children’s Hospital at the University of Michigan. Her first device was a DynaVox Maestro funded by our private medical insurance in 2010. 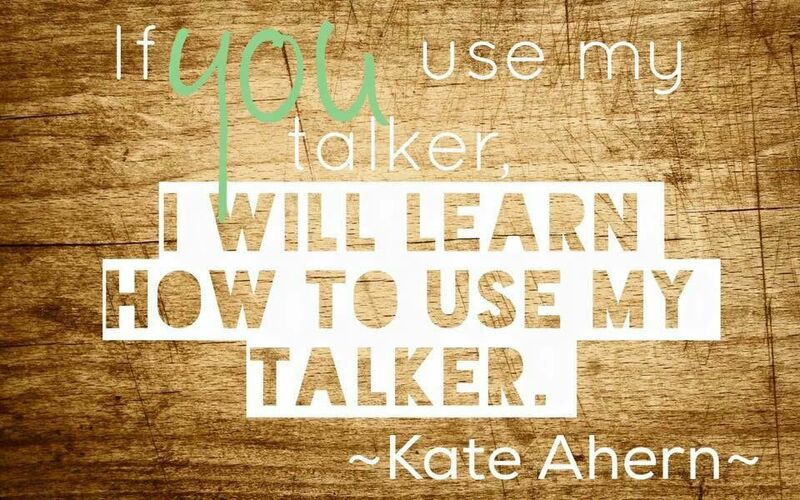 It is now known as the “Take a Bath” talker. No we don’t let it get wet, but the most often phrase it now utters is “TAKE A BATH.” The Maestro is in the perfect and convenient location to say “Take A Bath” on the way upstairs to a beloved sensory escape of bath time for Miss Gillian. Even with insurance funding most of the cost of the device, we were still responsible for about 20% of the cost which was paid off over 18 months thanks a zero cost zero% loan made available to families by the then singular DynaVox Corporation (DynaVox is now Tobii DynaVox after their merger). So needless to say, though now not used as a portable dedicated AAC speech device for Gillian, it now sits as a sort of ‘extra windows workstation’ / ‘take a bath requester’ on the desk in our dining room. It still functions well as a talker when needed, but probably more so now is a spare Facebook browser, Spotify broadcaster (great speakers for that), and email checker. 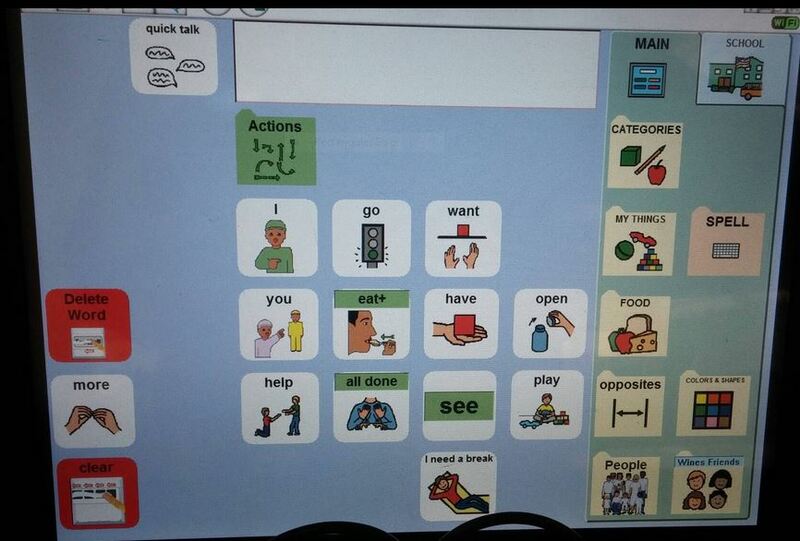 It maybe could be labeled as the first entry in our living AAC museum of sorts. Sometimes our first generation iPad is sitting nearby getting charged up, a likely second entry soon to the living AAC museum. When we moved to a different school district about 18 months ago, Gilly also began a center-based ABA program. Together with our school team and our BCBA/SLP, we made the switch to Proloquo2Go on an iPad mini. The Maestro was too heavy for her to ever carry around with much ease, so we really wanted to try an AAC app on the iPad mini. Because she had been using modified Gateway 40 on the Maestro, what I essentially did was ‘reconstruct’ her Maestro vocabulary as closely as possible based off of ‘core’ in Proloquo2Go. She did very well with the transition and within a month, we were no longer using the Maestro, but still made it available in a dedicated location. It gradually became the “Take a Bath” talker. For Proloquo2Go, I used 6 columns by 6 rows to result in a similar button size when the iPad was used in either portrait or landscape. This system has been working well for her the past 18 months. She navigates pages easily and knows the location of vocabulary. She is brilliant at receptive ID activities, also the tacts, mands and fill-ins of her ABA program. But we are all still noticing something: She is not reliably building two word phrases and sentences. Most of her use of the device is still predominantly single object requests and occasionally comments. I’ve been to several presentations about core vocabulary and language acquisition via motor planning. I’m also inspired by the emergent practice and research supporting aided language input and modeling of language by communication partners with AAC. We are now on the search for our next and more robust core language based system for Gillian. We are brainstorming ways to build more core based phrases and language modeling into her school and ABA program. Stay tuned. For the Love of “Larry”…. New things keep happening with Larry. Gilly is very attached to all things VeggieTales, especially Larry the Cucumber. She is loving the keychain sized Bob and Larry and takes them everywhere…even to school. In case you didn’t already know–our house is a ‘Bob and Larry’ house, or ‘Big Idea’ house. From silly songs to books and DVDs, we are big time connoisseurs of all things Veggie Tales. Larry the cucumber has especially been a buddy of Gilly for a few years now. So much so, that she adopted a musical ‘hot pickle’ game as her favorite friend and comfort object. She would take “Mr. Pickle” (as we called him–because ‘he’s a pickle and not a cucumber’) everywhere she went. “Carrying around stuff” has always been a Gilly trademark. Holding objects or fidgets can be a source of regulation and comfort for individuals living with autism. When fidgets are kind of over sized, like ‘Mr. Pickle’ (who is a good ten inches tall), finding something a little smaller may be more convenient. I was able to find keychain-sized VeggieTales backpack clips for Gilly. I ordered them hoping they could become her ‘on the go’ fidget pals. They arrived just last week. After I showed them to Gilly she wanted to carry them around the house with her right away….a good sign. Next, she put Larry and Bob side by side on the floor–just as they appear in the Big Idea logo. Gilly then grabbed a box of plastic letters off the shelf and dumped them on the floor. She grabbed the B…then the I….then the G….and placed them on the right side of Larry and Bob. What was going on here? Next came another I…and the D…and the E….and A. “B…I…G — I…D…E…A” she spelled on the floor–just like the logo. So what’s the ‘big idea’? She’s a speller! Gillian is learning from observing her environment even when we are not ‘directly teaching’ her. Can I just say…..We love Veggie Tales. “Presuming Competence”….and “The Least Dangerous Assumption”…. What is Presuming Competence? (excerpt from source: Douglas Biklen: “Begin by presuming competence”). Can you explain the concept of “presuming competence” and how it relates to inclusive education? When Anne Sullivan first worked with Helen Keller, she approached her with the presumption that she was competent, that Helen’s problem emanated from her not having an effective means of communication. Even before Anne began to work with Helen, there was evidence of her desire to communicate—she used pantomime to show her interest in making ice cream or wanting toast with butter. But it was Anne’s introduction of spelling and words that proved liberating for Helen. The principle of “presuming competence,” is simply to act as Anne Sullivan did. Assume that a child has intellectual ability, provide opportunities to be exposed to learning, assume the child wants to learn and assert him or herself in the world. To not presume competence is to assume that some individuals cannot learn, develop, or participate in the world. Presuming competence is nothing less than a Hippocratic oath for educators. It is a framework that says, approach each child as wanting to be fully included, wanting acceptance and appreciation, wanting to learn, wanting to be heard, wanting to contribute. By presuming competence, educators place the burden on themselves to come up with ever more creative, innovative ways for individuals to learn. The question is no longer who can be included or who can learn, but how can we achieve inclusive education. We begin by presuming competence. What is The Least Dangerous Assumption? (excerpt from source: Kate Ahern: Living the Least Dangerous Assumption). We live in a land of prerequisites and accountability, which leaves little room for “The Least Dangerous Assumption” as pioneered by Anne Donnellan and clarified by Rossetti and Tashie (2002). The least dangerous assumption is, of course, the premise that (in the absence of evidence) we believe we not yet found a way to make it so a child or adult with a disability “can” instead of believing he or she “can’t”. The issue, sadly, sometimes becomes that making the least dangerous assumption and thus presuming competence uses resources (time, money, energy). We must come to understand that refusing to presume competence is, in the long run, more costly than making that least dangerous assumption. In an article written by C. Jorgensen (2005), she proposes a new paradigm in the area of disability and competence. She found that often times if the child’s support team wasn’t sure what the child was capable of, it was presumed that the child could not (and never would be able to) learn to communicate. Jorgensen advocates that setting high expectations should be the basis for decision making regarding educational programming. In addition, Jorgensen believes that decisions made based on high expectations will lead to a higher quality of life in both school and beyond. Aim high with those expectations. Presume competence in those who are differently-abled. A paradigm shift can make all the difference in long term outcomes.